I have had today marked on my schedule for weeks, the first Bullseye Match (sort of) I have gone to. 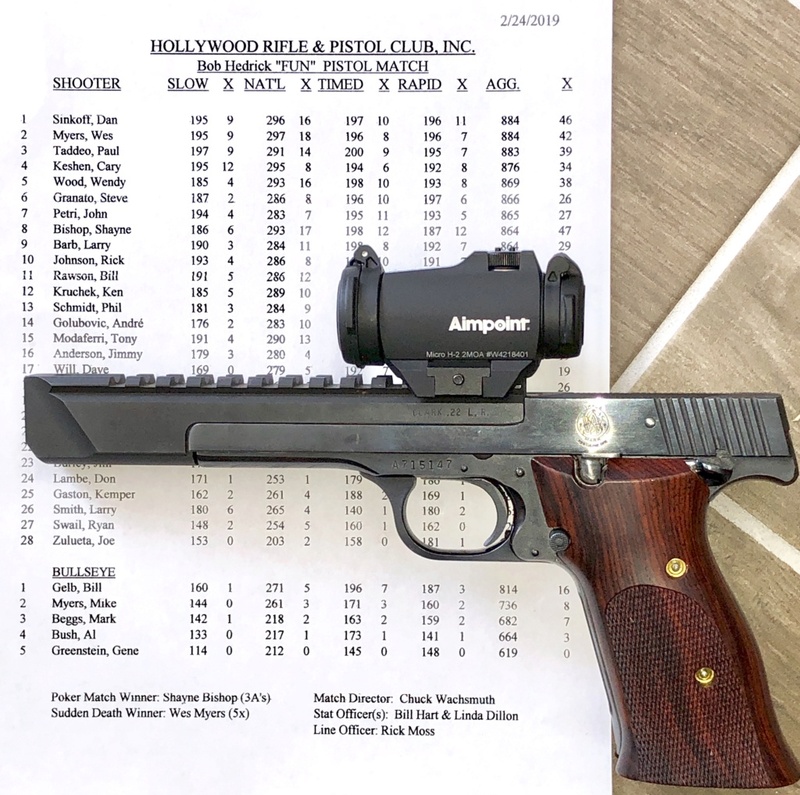 My club, Hollywood Rifle and Pistol Club, puts on a monthly Bullseye Match. It's split in two sections, depending on how many hands you want to use. I've been practicing with my Model 41, using the Aimpoint 9000sc for a while, then deciding it was heavier than I liked, especially if I wanted to shoot one handed. So I took that sight off, and mounted the Aimpoint H2 yesterday, sighted it in, then just relaxed until today. Still wasn't sure if I really wanted to try one handed, but between you guys, and Dave Salyer, decided (if I didn't chicken out) to do the real thing. Got there what I thought was early this morning (8am, for.a 10am match) but everyone was already there - the place was packed. I wandered over to the much less crowded one-hand section, and talk a table. Then people started coming up to me, asking if I really wanted to shoot at 50 yards with one hand? Once I answered "yes", I was committed. It turns out there were 28 shooters in the two-hand group, and five of us in the Bullseye group. I reminded myself to treat the match like "organized practice", NOT a competition. If I did have a goal, it was not to finish last, but even that was a minor goal. I decided I'd just shoot the way I normally do, and things would work out one way or another. Now that it's over, my thoughts. First, all the "jitters" and "nerves" vanish when you're just shooting for fun. With a few minor exceptions, everything about the match was great! When I wasn't sure what to do next, the guys around me helped out. Scoring - I started out scoring like I do with my own targets at the end of the day. Wrong!!! Eventually the guys got me straightened out. I should find an article on how to properly score. Preparation - I tried to be prepared ahead of time, magazines loaded, everything in its place, and everything not needed off my table. That made life easier for me. Time.... in the slow fire sections, I tried to aim carefully, but I finished much too soon. I guess I should force myself to take longer, paying a bit more attention to EVERY shot. On the faster sections, I struggled to keep up. I finally gave up, and shot the way Dave Salyer taught me, get the wobble zone over the bullseye, and carefully fire. Doing things that way I always beat the buzzer, but quite often I felt rushed, shooting before I was really ready. I figured a mediocre shot is better than a carefully aimed shot that happens after the targets are already closing. Fun.... I was having a great time. The advice from so many people here in the forum really, REALLY helped. I wasn't shooting as well as I would have liked, but especially for one hand, I was shooting FAR better than I ever thought I could. I had a great time. I plan to make it to a lot more matches, and join the Bullseye group each time. Gear... The Model 41 was beautiful. It's great when you trust something to just work. If I did my part, it always did it's part. Not a single problem all day. When the dust settled, I finished second in the Bullseye group. Goals for next time, and from now on, I'll try to make every match I can. For starters, my beautiful Hogue wood grips just are NOT comfortable with one hand. I bought a pair of custom fitted wood grips in this forum a few weeks ago, they are now back on my gun. I should have brought them today. Next, I need to learn how to handle time better. I shot faster than I needed to on the slow sections, and not as fast as I should have on the faster sections. A good bit of that is wasted time getting the red dot into the sight area. I guess that's just practice. Guns - I have two, my High Standard, and the S&W. Considering that I haven't had a single issue with the Model 41 in ages, that will be my choice. I meant to clean it before the match, but someone here said that was a terrible idea - so next time, I'll clean it a week before the match, then practice during the week. Muffs - the Howard Leight Impact Pro muffs were great - I turned up the volume to the maximum level, and I could hear everything going on around me, but the gun was still super quiet. It's only a 22, but I was very pleased - no ear plugs under the muffs, as when I do that, I can't hear the range commands so well. Dots - Jon's advice about focusing on the dot helped a lot, once the dot was there to see. I guess if I practice enough, my gun will come up in front of me lined up correctly. I still need to ask at what moment I'm allowed to raise my gun - can I get the dot centered over the target, before the target rotates? And if I didn't say it clearly enough up above, maybe I'm slow to learn, and sometimes even slower to understand, but the help people were giving me in the 'fundamentals forum' last year really helped out. I've still got a long ways to go, but today went better than I dared hope it might. Most of the holes in the black, at a range of 50 yards, is something I may have hoped for, but never expected to actually do. Thanks!! A 736 for your first match is fantastic. If memory serves me, my first match was in the very low 600s. Great job and welcome to addiction!!! Mike38 wrote: A 736 for your first match is fantastic. If memory serves me, my first match was in the very low 600s. Thanks, but never having been to a regulation Bullseye match, I don't know for sure that I did the same things the same way that official matches are run. In the Bullseye group, we shot first at 50 yards, then moved our targets to 25 yards to continue. Everyone was using .22, nothing larger. I doubt what I did was "fantastic". It was better than what I expected, but that's all. Maybe we did things differently than what is done in an NRA match? Maybe the targets were different? These are the match rules, except that Bullseye shooters used 50 and 25 yards, and at 50 the bull was larger. Yes....that's the way it's usually done SF match. NMC, TF match, RF match, and you did an excellent job. Congratulations on making it happen!!! Some of your early posts felt like you would not convince yourself to make the switch to one hand. When I joined this forum, I had trouble just keeping the sights close to the X, due to many reasons, including the weight of the gun. As I found out later, my trigger finger was messing up my sighting much worse than I imagined. Following advice here, and lots of dry firing, things got better. For one hand shooting, I didn't think I could even hit the target, let alone the black. So when I went to India with my "fake gun" I'd practice holding it up one handed. When I came back last month, I started seriously thinking about doing Bullseye properly. Linda Dillon, the secretary of our club, asked me if I wanted to go home with prettier targets, or feeling I had accomplished something. Dave Salyer wrote "The Hollywood match sounds like fun, but I think you are ready to shoot the official bullseye match. I’ll attach a typical description", along with lots of other "suggestions". My thoughts - it's like learning how to swim. Once you know you CAN do it, you can concentrate on doing it better. I also started to think I was "cheating" participating in this forum but still using my left hand. Anyway, regardless of the score I got, I know I've got a long way to go. At the very minimum, I want almost all the holes in the black bull, even at 50 yards. From looking at the back side of other people's backing boards when the match ended, maybe a lot of people have the same wish. Doesn't matter what they do, or don't do, all I'm concerned about is what I do. So finishing first, or second, or 30th isn't really important - all that really counts (to my mind) is my own score. Winning or losing has more to do with the other competitors, than with me. Mike, awesome job on your first time out......736 is a GREAT score!!! Now don't look back, the sky is the limit....well, maybe 900 is the limit, but you know what I mean! India? Many places all around South India. I do volunteer work at Aravind Eye Hospital, and I travel around as needed. I do photography, camera development, computer work, and IT. I am in no way even close to being an eye doctor, but I help them make training and educational videos. The village where that photo was taken is the village Dr. Venkataswamy, the founder of Aravind, grew up. There is a chance that we can get the smaller Bullseye group to shoot centerfire, rather than rimfire. Same everything, but more noise. Linda told me they used to shoot 9mm that way. Maybe I'll start practicing at 50 yards instead of 25. The additional walking would be good for me. You guys should stop complimenting me. I don't think I'm that good. I didn't shoot it as a "match", where I was competing, I just dealt with it as "organized practice". Shoot when they let me. I need to ask Linda which targets I was shooting at. I know it was the B-8 at 25 yards, as that's what I always shoot at for practice. At 50, I was told it's the same thing, but the black part of the bull is larger. I don't know why the size of the black matters. Are these the same targets used in official NRA matches? I'm going back the range tomorrow for practice. I'm not sure what gun I'll take. If I get my black powder "fix", maybe I'll shoot that. The 50 yard black is out to the 8 ring to make the aiming black appear to be the same size as the 25 yard target. Roughly. The scoring rings are the same. The target is the B-6. Aha! Makes sense. I never knew that. So visually, your eyes "see" the same thing at either distance. Thanks! Great job for the first match. If memory serves me, I often shot in the low 50's on my SF targets when starting out. Here's a hint from an old "has been". A stop watch during slow fire will keep you calm. I will try that. Do you set it to time a little less than what you're allowed, so you have a warning when time is about to run out? Here is how I do it... I raise the gun as above and check my alignment with the target, shuffle my feet to get a natural point of aim. Lower the gun and rest until ready on the left is called. This works for almost everyone unless the caller is too slow or two fast. It should have a nominal 3 second pause between commands but it isn't always. So to lessen fatigue you can adjust your final raise. I didn't know that - I was just paying attention to when the fellow on my left raised his gun, which seemed to be when we heard "READY ON THE LEFT". A link I posted last night suggested sighting on the edge of the target when raising the gun. In retrospect, that sounds obvious. I did run out of time once, and fired as the targets were turning. There was a long gash on the target where that shot hit. Here is my reasoning for not marking your feet position. You want your body balanced as well as possible WITH THE GUN EXTENDED. Guns do not weigh the same. You will see experienced shooters get their stance and hold their arm out pointing at the target. This is not good. A more important factor is that our stance needs to change as fatigue sets in. We may find it comfortable to stand at 45 degrees at the beginning. As we tire the comfortable stance will migrate to be more perpendicular to the target. Body weight is a factor. We that have a “slow fire” stomach will stand more parallel to the target line to get balance. Slender people need to stand closer to perpendicular to the target line. What I have just described is very important in rapid fire to keep us from springing back to a wrong stance during the heat of battle, giving us a good group, but to one side or the other. All this being said, the priority is that we actuate the trigger smoothly. Lots of writers cover all the best techniques but do not assign priorities. One of the best examples is procuring an x-ring or better gun at 50 yards, while almost ignoring trigger control. We need x-ring guns to give us confidence and to keep us logical in troubleshooting our bad hits. Lots of curious things buried in the rule book. If you raise before "ready on the right" you're doing something wrong. I don't know enough to comment on the rules, but from what everyone is saying here, is it acceptable to raise your gun when you hear "ready on the right", move your feet if needed, then lower the gun, and then raise again for keeps on "ready on the left"? zanemoseley wrote: If you raise before "ready on the right" you're doing something wrong. a lot of people do, checking their stance, correct alignment or what eve,r then they lower down. Most people lift to settle around the ready on the right or left command. Mostly its after the line is ready commend you'll see people do it. You can do whatever you want after being told “you may handle your guns” with the exception of only loading pistol when commended to load. I may dry fire several shots before loading the magazine into the pistol. As long as you keep it pointed down range you are good to go. Lifting and lowering before the target turns is a learned process. Everybody does it slightly different. You just need to see what works for you. If you lift to early it adds fatigue. Lift to late and you might be lowering when targets turn. Just try to be consistent. Also learn how to stage your breathing before the turn. Practice practice practice! As usual, Jon has it right. Many AMU shooters are dryfiring as soon as "handle your guns" is announced. Jon Eulette wrote: You can do whatever you want after being told “you may handle your guns” with the exception of only loading pistol when commended to load. I may dry fire several shots before loading the magazine into the pistol. As long as you keep it pointed down range you are good to go. Lifting and lowering before the target turns is a learned process. Everybody does it slightly different. You just need to see what works for you. If you lift to early it adds fatigue. Lift to late and you might be lowering when targets turn. Just try to be consistent. Also learn how to stage your breathing before the turn. Practice practice practice! now that i think about it that is true. It is generally considered that before the "load" command you can raise your gun, check your position, dryfire, etc., as long as the range is clear and you can handle your guns. See the complete commands. After the "load" command for any string, the section that Clark mentioned above seems to be a reasonable expectation in terms of safety on the line and range after the guns are loaded. Glad to hear that you finally took the plunge into the deep end! Now just keep that extra hand in your pocket and you'll be surprised how quickly it begins to feel natural to shoot one handed. That minimal "bench" arrangement in the above images looks like it may be a bit awkward for both resting and positioning yourself in preparation to shoot. 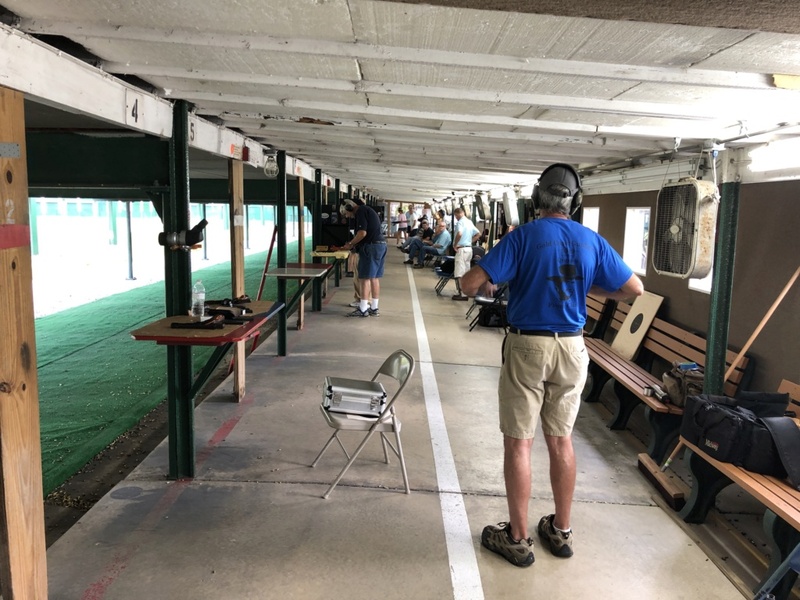 I've only shot at a few different ranges, but they had full width benches, which makes it much nicer in my opinion. Perhaps those shown above are larger than they appear though. Thanks! Surprisingly, one hand shooting feels at least as natural now, maybe more so, than two. Even more surprisingly, the gun feels as steady now as it did before with both hands. I didn't expect that. Benches are small, as they only have so much space, and want to accommodate as many shooters as possible. Each "bench" is divided, so two shooters share it. I'll take a photo next time I'm there. A "real" shooter's box would be a huge help, but I don't have one (yet).